FILE - A MQ-9 Reaper drone taxis at Kandahar Airfield, Afghanistan, Dec. 27, 2009. MQ-9 Reaper drones are reportedly armed with Hellfire missiles, laser-guided bombs and other munitions. The United States has tripled the number of air-delivered munitions in Afghanistan this year and is training hundreds of soldiers who will soon start advising the Afghan army in combat areas outside of military bases. U.S. General John Nicholson, the top commander of international forces in the country, said via teleconference from Afghanistan Tuesday that the increased air power has allowed Afghans to more aggressively pursue the Taliban. The increased air power is made possible by new authorities granted to U.S. forces in Afghanistan under the administration of President Donald Trump. Under former president Barack Obama's administration, U.S. airstrikes were limited to cases of self-defense when the Taliban were in close enough range to present a direct threat to American and Afghan forces. As of October of this year, the U.S. had conducted more than 2,700 airstrikes in Afghanistan, Resolute Support spokesman Army Lt. Col. Koné Faulkner told VOA. U.S. Army General John Nicholson arrives ahead of a press conference in Kabul, Afghanistan, Nov. 20, 2017. 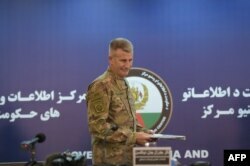 During the briefing, Nicholson outlined a major effort aimed at improving the Afghan offensive that is expected to begin when the weather warms next year. The U.S. Army is training 800-1,000 soldiers, whom Nicholson calls “volunteers,” for its “first security force assistance brigade”. The Army will produce a total of six security force assistance brigades to advise the Afghan army at the battalion level, known as the "kandak" level in Afghanistan. U.S. military officials say this strategy has been successful with American troops who have been advising Afghanistan’s special forces at a lower level during the past two years. “This will enable us to help the Afghans with their offensive operations simultaneously in multiple corps,” Nicholson said. The general said the advisers will operate in teams that will be backed up by additional American enablers, in order to protect the U.S. forces and their Afghan counterparts. The new strategy, however, puts hundreds more Americans at risk of getting caught in combat as they advise their Afghan partners in the field. The goal is to secure portions of the population who are living in contested areas before the upcoming Afghan election. The government controls about 64 percent of the population, the Taliban controls about 12 percent of the population and the other 24 percent live in contested areas. 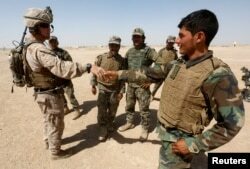 FILE - A U.S. Marine shakes hands with Afghan National Army (ANA) soldiers during a training exercise in Helmand province, Afghanistan, July 5, 2017. The new Afghanistan strategy Trump announced in August adds about 3,000 American troops and additional NATO coalition partners to the Afghan fight, the bulk of whom will advise and assist Afghan forces down to the brigade level. The strategy also aims to focus on major players in the region, including India, China, Russia, Iran and Pakistan. U.S. leaders have expressed frustration over Pakistan's seeming unwillingness to prevent terrorists from using their territory to escape pressure in neighboring Afghanistan. Tuesday, when asked if the coalition has seen any significant change in Pakistan cracking down on militants crossing into Afghanistan, General Nicholson told Pentagon reporters, "We are hoping to see those changes, we are hoping to work together with the Pakistanis going forward to eliminate terrorists who are crossing" the border.